Since 1999, Florida-based XOS Digital Inc., has provided digital coaching technologies for collegiate and professional sports organizations across the country, including the San Francisco 49ers. 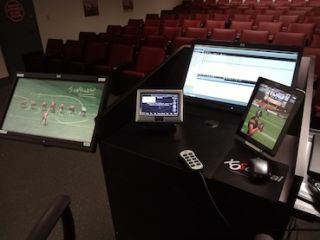 Among the company’s product offerings are two turnkey systems that allow coaches to draw on video to diagram a play: the XOS Coaches Command Station features a large screen display option for use in conference rooms, locker rooms and auditoriums; and the XOS Courtside Coach, which offers “on the fly” corrective instruction on real-time practice video. Instead of using a PC with a capture card and annotation software, both of these systems use professional video recording and display equipment that integrates a standalone hardware-based annotation system — here, the Pointmaker video marker manufactured by Boeckeler Instruments Inc., based in Tucson, AZ. The latest Pointmaker model XOS installed in its systems is itself a switcher/scaler – it can input virtually any video signal out there, and then scale and output the video and annotations as a single signal to anything from computers (PC or Macintosh) to high-definition projectors. As for customer service, Jones said he was very impressed with how Boeckeler president and CEO Pat Brey and Pointmaker sales manager Victoria Ferrari worked closely with XOS from the beginning to develop their first prototypes and make later improvements. “They listened to us throughout the years,” Jones said, “and they adjusted their hardware and firmware to cater to what our clients needed.” Clients that just happened to include the San Francisco 49ers. As the XOS and Pointmaker teams make a play for the future, they plan to streamline their products by adding faster capture and print capabilities, wireless tablets, and more seamlessly integrated large format touch screens.